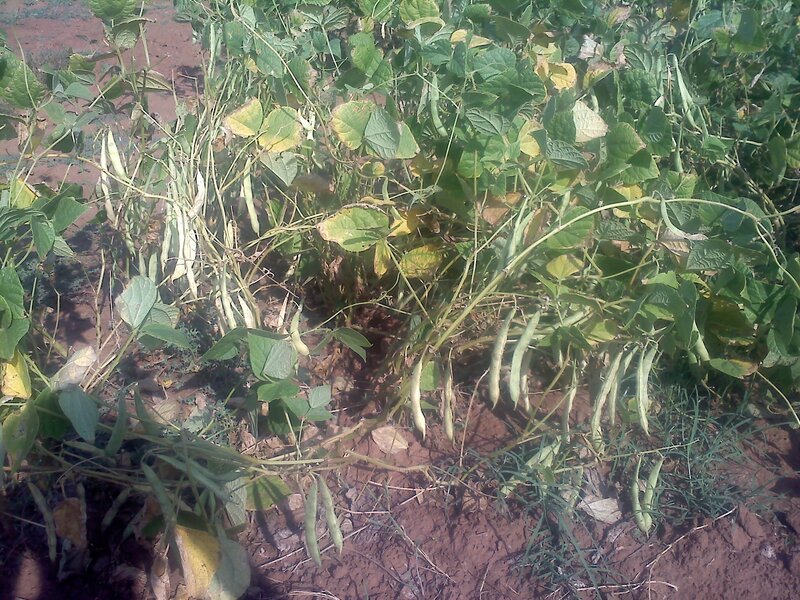 Some of the pinto beans nearing harvest. Things have been very slow around here lately. The plants are doing basically what they do: grow very slowly. The pinto beans have filled out very nicely and one of the two fall plantings is getting close to harvesting. I should be able to harvest sometime in the next few weeks. I think I will be getting considerably more beans than the harvest earlier this year. The beans were planted much closer than previously. I like how this turned out enough that I will intend to do this from now on. 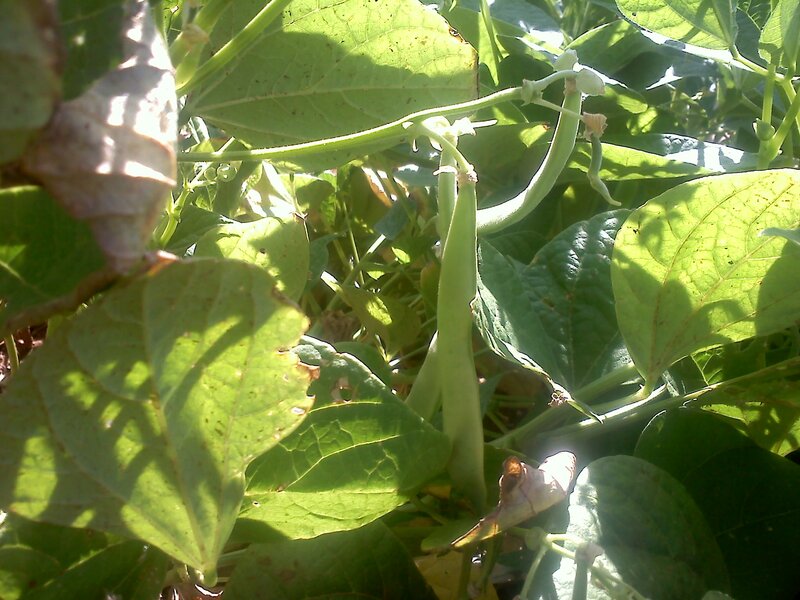 I have a few more patches of beans growing in the garden that are probably a month behind these. If this winter is anything like last, things will be very mild and I should be fine, but there is always the chance of a surprise frost from mid October on. 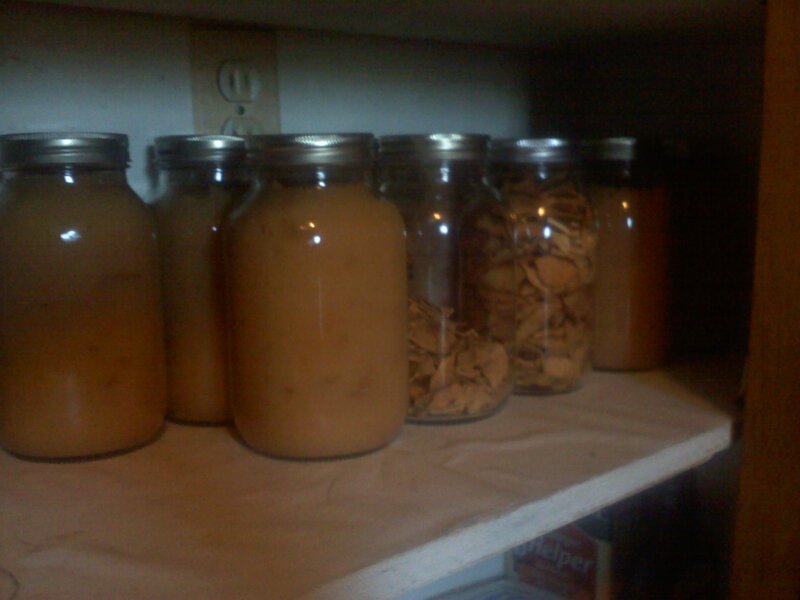 Jars of apple sauce and dried apple chips. I finally managed to get the apples finished last week. I ended up turning the remainder into apple sauce and canning it. Doing everything manually takes a lot of work. I was only able to make about two or three quarts in a given evening and it left me quite exhausted. Things like this remind me how much I have been spoiled with food so far. Chives gone to seed. I’m hoping to collect these seeds for next year. It is about the time of year to start thinking about the next year. There is still a huge list of things that need to get done. Finishing up the harvest, planting fall garlic, adding compost and manure to the garden before putting it to bed for the winter. I plan on planting lots of pinto beans next year, but I am also thinking of trying a few more things. 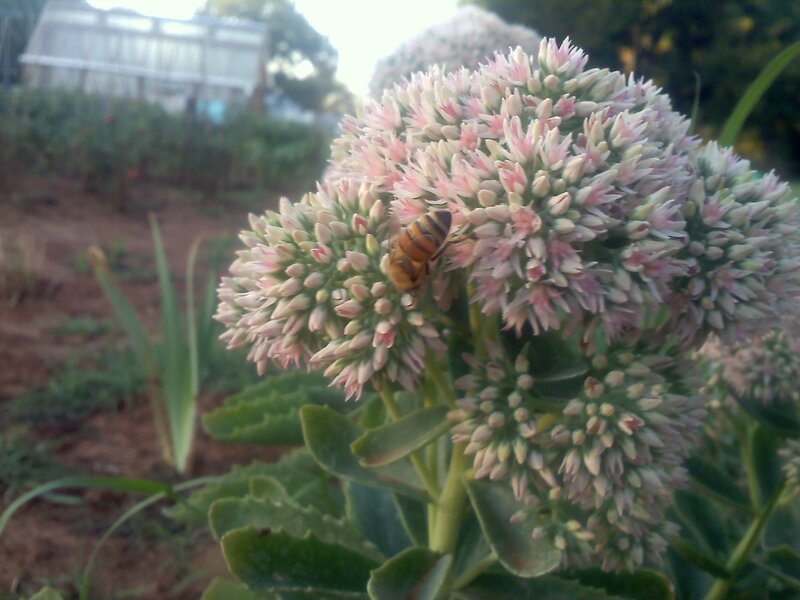 A honeybee on a cluster of flowers. This flower I got from my grandparents. 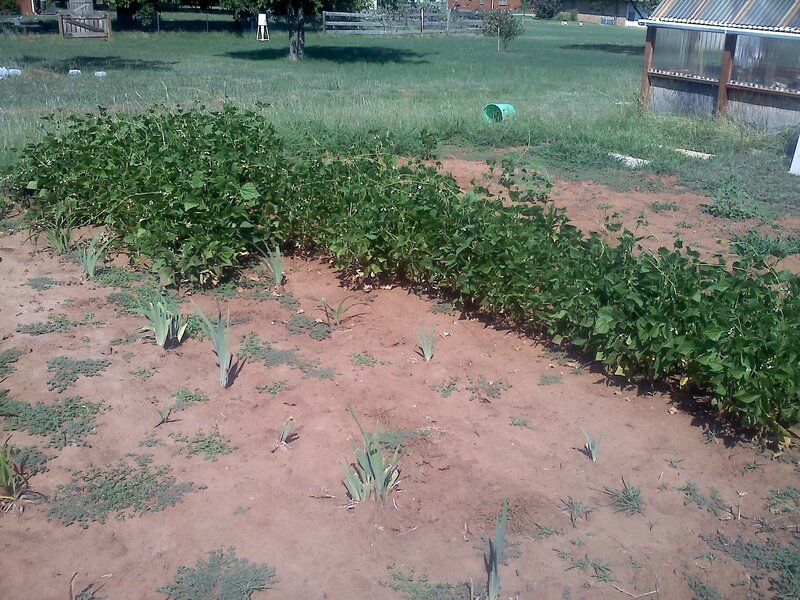 I want to try planting a small plot of buckwheat. This should give me something like a grain and also provide a good nectar source for the bees in the spring and fall when they really need it. But first, I want to get a separate garden plot for it because buckwheat has a tendency to drop some seed before it can be harvested. Each year is a new start with gardening, and I feel like I have learned a lot in my first year. Maybe by the third or fourth year I might start getting good yields from the garden and I can start being more adventurous with my plantings. I enjoy trying to make the future into the present. Finally, some more bean pods. I just got back from a week-long trip for work and came back to find that the beans are putting out pods once more. The last round of beans I planted were pretty much a dud as I got not even a full handful of beans out of the crop. So far, this is looking to be my largest crop yet. The plants are packed in much closer than my first attempt at beans and there are flowers on everything. Some of the last round of beans decided to start flowering as well, so I will probably end up getting a some beans from that as well. One double row and a partial single row of pinto beans. There is communal bee feeder at the very top of the picture. The two latest plantings were both directly seeded into the ground in double- and single-rows. I am liking how this is turning out much better than my first plantings started in the greenhouse and I will probably be doing this for all but very earliest crops started before the chance of frost has completely passed. I think that I will be doing that from now on to try and get as much in before the high summer heat stops everything from producing fruit. 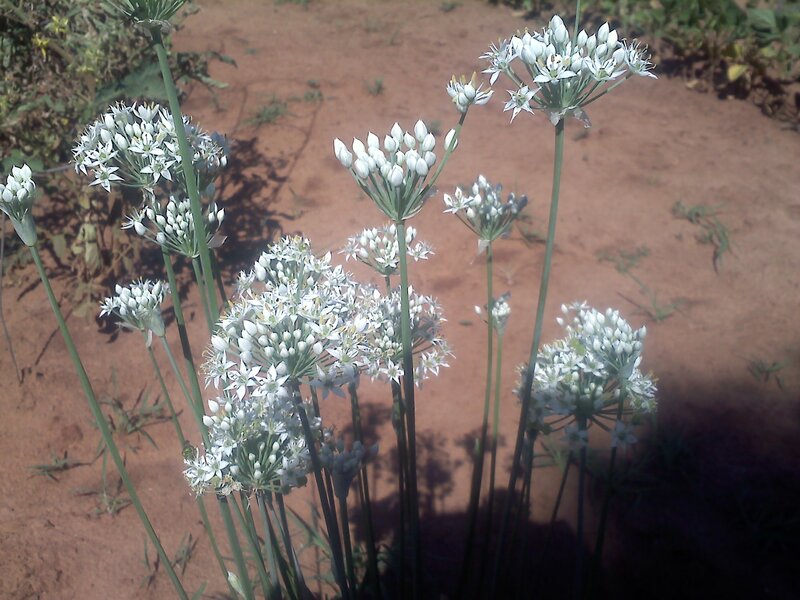 Flowering chives. I hope I can get some seeds off of this. 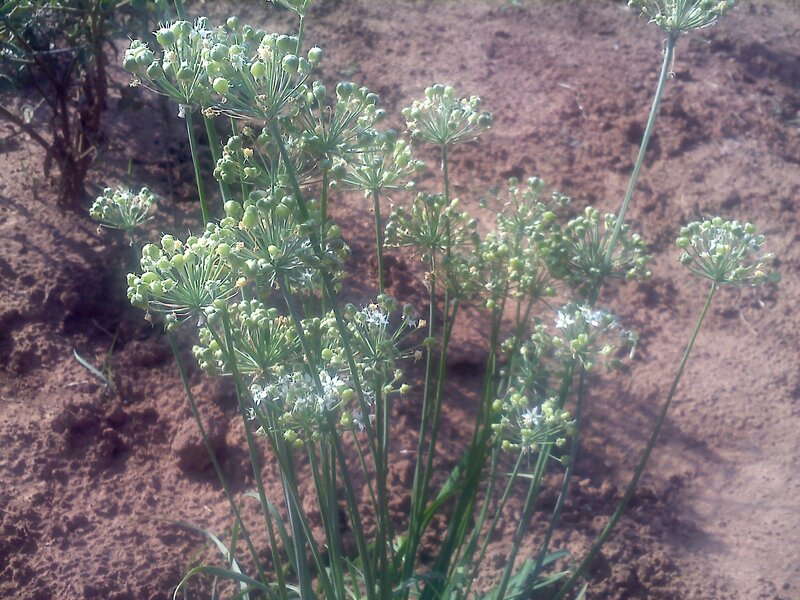 When my grandparents came to visit, they left me with a bunch of chives in addition to other plants and flowers. Regardless of what I get out of this plant, the flowers are quite beautiful. I think it was worth getting for just for that. Once the summer heat wave broke and we were no longer dealing with highs of 115, the plants have sprung back quickly and the flowers are seem to be trying to make up for lost time. I’ve seen more growth in the past couple of weeks than I have in the rest of the time I’ve had them. It makes me hopeful that I’ll have some really nice flowers to show off next year. 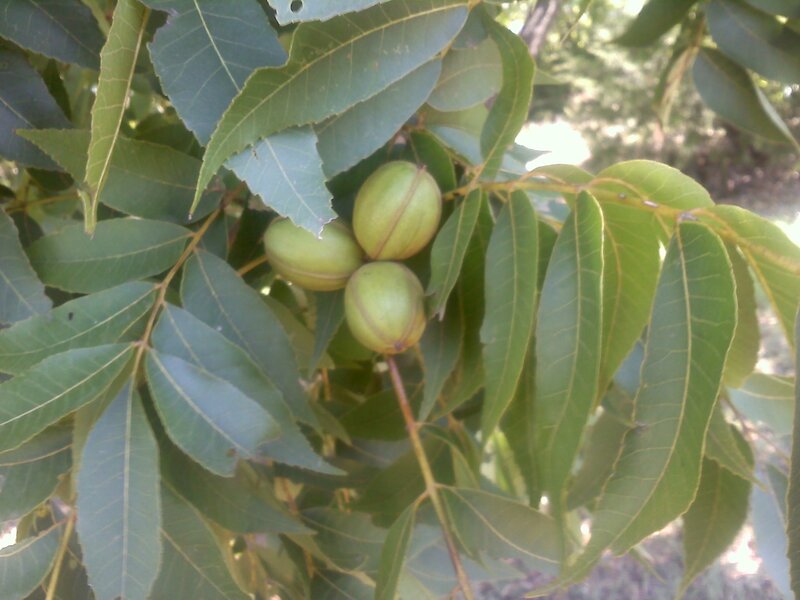 The pecans are getting nice and big as the harvest starts getting closer. After I finish with harvesting all the apples, the only tree harvest remaining will be the pecans. This will be the first pecan harvest I have here. I’ve had one other place that I have lived where there was a pecan tree, and that produced a freezer full of pecans from a single, giant tree. I don’t think that any of the trees I have will produce that much, but I do have four trees, so I might end up with more pecans. A bunch of bees and one wasp on the communal feeder. 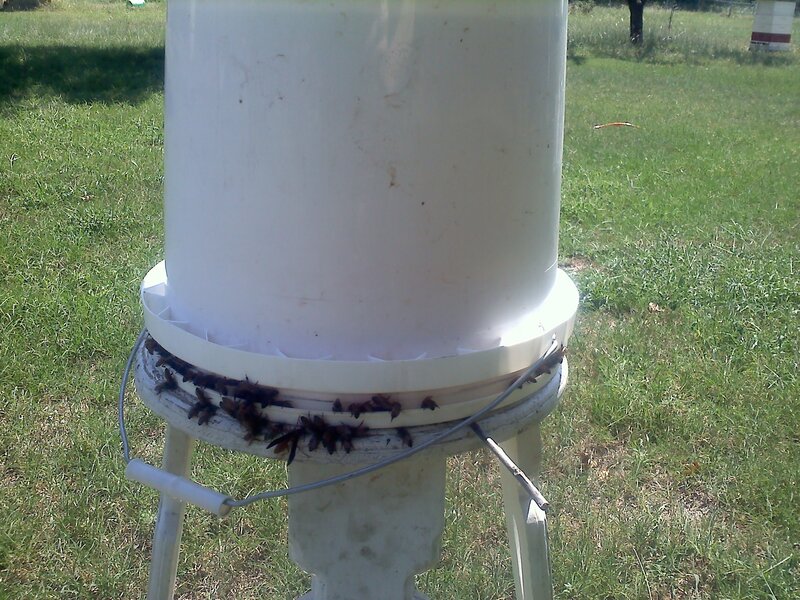 While I was gone on my business trip, my brother in law stopped by to build a communal hive feeder and to do inspections. This should make it quite a bit easier to provide large quantities of feed to the hives without a lot of work. During the inspections, it looks like the blue hive has no eggs in it. This may be because the queen stopped laying, or because the queen died. I hope it is just the first. But to be safe, a frame of brood has been moved from one of the other hives so the bees are able to raise a new queen if the old queen died.